Last year saw the launch of Chris Schweizer's Crogan "series." I use quotes there because the individual books don't really relate directly to one another, other than that the main characters are distant relatives of one another. (Something akin to the various Black Adder seasons.) 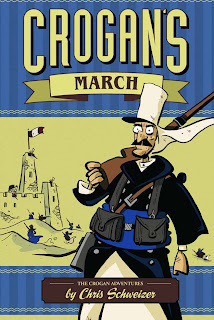 I was quite impressed with Crogan's Vengeance so I was more than interested to check out Schweizer's second installment: Crogan's March. Crogan's March is about Peter Crogan's last days with the French Foreign Legion. His troop battles sandstorms and raiders and uniforms that are far too uncomfortable without underwear. Crogan eventually finds himself alone, and facing exceptionally daunting odds. But as the chips begin to fall, he steps into the role of a true hero and embodies the stuff of legends. Well, family legends at least. The story is told primarily as a flashback over lunch. A father trying to teach a lesson to his two sons, using his own ancestral legends as the vehicle. He even notes: "This skirmish was a footnote to a footnote, part of a conflict on that hazy border between East and West that seems like it might go on forever." Of course, therein lies the true magic of storytelling. The audience doesn't need end-of-the-world scenarios, or all-life-hangs-in-the-balance events. The audience just needs to become attached to and believe in the characters. The events they go through -- regardless of their lasting importance on the world -- are dramatic ONLY if we give a damn about these characters in the first place. Fortunately, Schweizer does that here. Certainly, we feel for the protagonist, but we get a very real sense of nearly all of the named characters. I was actually quite taken aback when one of the prominent characters, who struck me as a sort of sidekick, was killed. And not in a sacrificing-himself-for-the-hero sort of way either that you might expect in a more pat TV show or movie. It wasn't a hero's death; it was a soldier's death. It's emotional truth helped make the story that much more poignant, I thought. When I read Crogan's Vengeance, I was impressed with the historically accurate details Schweizer wove in to the story. It made the story richer for people like me who are more familiar with that era, but it also helps to imbue the overall story with that emotional truth. I know almost nothing about the Foreign Legion -- indeed all that I do comes from the Laurel & Hardy comedy "Beau Hunks" -- but Crogan's March strikes me as having that same emotional truth to it. The details feel right throughout the whole book, and I have to believe Schweizer did as much research for March as he did for Vengeance. It's hard not to be impressed with his artwork, too. Everything I said about it earlier still holds, and I'll repeat it here because it's equally valid for March. Interestingly, Schweizer's illustrative style is fairly agile as well. The linework is easy, but detailed. While there's a definite cartoony feel to the character designs, there's enough there to see the characters as more than mere cartoons. The characters have weight and move freely about the page. I'm not familiar with Schweizer's drawing methodology, but I get the impression it flows out of him not unlike how it did with Jack Kirby. I can envision Schweizer simply starting in the upper left corner of the page and working his way across and down and, before you know it, the page is done. I've been unduly impressed with both of the Crogan books thus far; I can't make a single complaint against either of them. Well worth picking up. After the high caliber of these two books, I'm in eager anticipation of Crogan's Loyalty, due out in 2011. Seriously, I can't recommend these enough. I just seen quite a few pages of Schweizer's art at The Children's Illustrated Art Museum. Very cool.